At Food Warming Equipment we understand the needs of the greater community around us. 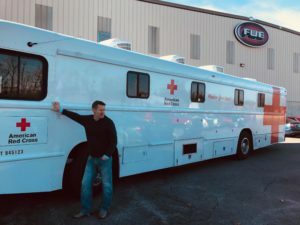 That is why we have partnered with the American Red Cross to host a blood drive for FWE employees. Founded by a nurse who worked during the American Civil War the American Red Cross official began operations in the early 1880s. For over 135 years the American Red Cross has been saving lives not only at home but abroad. Nearly 40% of all the blood donated in the United States comes from the American Red Cross. American Red Cross FWE Blood Drive, FWE’s National Sales Manager Travis Hartley shown donating blood. Blood donation is but a small part of ARC’s humanitarian activities including First Aid, CPR, Water Safety, Scientific Research, Cellular Therapy, and many more. But the ARC is most notably known for its Disaster Relief programs during Hurricane Katrina, the 2010 Haitian Earthquake, and others. Hosting the blood drive was an easy set up all any host needs to do are three simple steps outlined on the redcrossblood.org website. The host needs to offer a suitable location for donating. They need to help recruit donors within the organization. It is the responsibility of the host to schedule the donors for the appointment slot. The ARC does the rest. 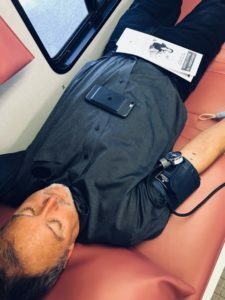 American Red Cross FWE Blood Drive, FWE’s Vice President Chris Huffman shown donating blood. 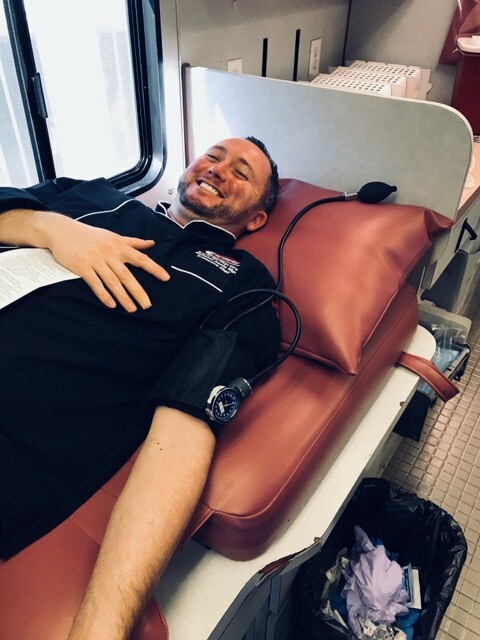 FWE was proud to host a blood drive for company employees on January 31, 2018. Many employees including company Vice President, Christopher Huffman (shown left) were present to donate. For every person that donates blood can have the potential to save the lives of up to three people for eight to ten minutes out of a day FWE thinks that it is worth every second. Go to redcross.org to find out more information about donating blood or hosting your own blood drive!